With his signing finally made official by the Flames, my phone conversation Friday afternoon with Calgary GM Brad Treliving was an opportunity to learn more about Daniel Pribyl. His height -- 6-foot-3, his weight -- 216 pounds, where he played and when he played there, his point totals... been there, read that. Anyone with an Internet browser has been poring over such particulars for weeks, ever since the first rumblings that Calgary was among the NHL teams pursuing the 23-year-old Czech forward. This was a chance to dig much deeper, to glean more intel on a player that I've never seen play. If there is an Extraliga version of NHL Game Center, I don't subscribe to it and the Czech Republic is where he's spent his entire career. So, armed with a list of probing questions, I got into it and like any good reporter should do, I began with an easy one. How do you pronounce his last name? Pree-bull is the phonetic version of his response, accent on the first syllable. "Or at least that's what I've been calling him and he hasn't corrected me yet," chuckles Treliving. Next up, does he remind you of anyone? Now this a question met with some hesitation. The humming and hawing at the other end, while saying nothing, is also saying a lot. Clearly it's a question he's reluctant to answer because he knows the risks. "I hate to use comparables," he finally says. "Let's be clear, this isn't Panarin. They're totally different players." While the circumstances may be similar to last summer's coup by the Chicago Blackhawks -- 23-year-old offensive forward signed as a free agent after playing in Europe -- the expectations should not be. Artemi Panarin just put up 77 points, 21 points more than Jack Eichel who was second in rookie scoring. It was the most productive rookie season since Evgeni Malkin had 85 points for Pittsburgh in 2006-07. "We are not pencilling him into top line right wing. He's not carrying the franchise on his back to the promised land," says Treliving. "What we've done today is made our reserve list better by adding a player, who fits the profile of the type of needs that we have. "He's going to come into camp in September and we'll see where he is at. There's a good likelihood he'll need time in the minors but with a two-year, two-way contract, you're mitigated in terms of your risk. But we think there's upside." The other reason for caution is to learn from history and avoid a repeat of how things unfolded with the last Czech forward Calgary signed. Four years ago when Roman Cervenka was inked, Flames GM at the time Jay Feaster was guilty of overhyping him, of building up too high of expectations. After battling through blood clot issues that sidelined him during training camp, Cervenka would score nine goals and 17 points in 39 games -- not bad all things considered -- yet the signing was generally viewed as a failure and he returned to Europe the next season. So you can understand Treliving's desire to downplay expectations. However, in terms of comparing style of play, Treliving eventually coughs up a couple of names. When he first saw him, he admits Pribyl reminded him of longtime NHLer and Czech Robert Lang, who Treliving had in Phoenix in 2009-10 for what was the 39-year-old's final NHL season. "He's built differently than Robert, who was a real thick guy, Daniel is more lean, but he's got big, strong legs and he's got a good frame on him. Robert was also a smart offensive player." San Jose centre Tomas Hertl is another name that comes up although again, not in terms of future projections. After all, Hertl was drafted 17th overall in the 2012 NHL Draft, one year after Pribyl was a sixth round pick of the Montreal Canadiens,. "He's a little bit like a Hertl when he came into the league. Now Hertl is a terrific player, but during his draft year, you worried a little bit about his skating and that's improved. So he's that style of player." With the disclaimers out there and on the record, Treliving did have plenty of complimentary things to say about the Pribyl, who was sought after by multiple NHL teams and with 45 points (16 goals, 29 assists) in 45 games, finished second in 2015-16 in league scoring. Here's a delicious plot twist. The only guy with more points? Roman Cervenka. Pribyl also had 11 points (5 goals, 6 assists) in nine playoff games before getting hurt. "He's a big body, a long, lean guy, but he's a skilled player. This isn't a guy that's going to run you over," says Treliving. "His assets are real soft hands and real quick hands, a big reach and an ability to make plays in small spaces. He sees the ice real well too." As for his skating, there's room to get better but Treliving didn't sound overly concerned. "His skating is fine. He's not a dynamic skater by any stretch. He's got to improve in terms of quickness off the mark, in terms of an explosiveness, but once he's in motion, he has a long stride." Credit for identifying Pribyl early, tracking him and getting him over the finish line goes to a trio of Flames scouts. European amateur scout Bobbie Hagelin, based out of Sweden, played a role. So did North America and Europe pro scout Todd Woodcroft and North America pro scout Derek MacKinnon. Treliving tipped his cap to the latter two in particular for taking the lead on this one. Involved was multiple trips overseas to the Czech Republic as Pribyl had been on Calgary's radar going back to last year. However, it was this season that things really took off for him as he posted the best offensive totals of his career. "He's a late-developing guy. He's not 18 or 19, he's 23 and we feel his body is physically developed and his game has been developing too. At times, he was a real dominant player this year," says Treliving. "As the season progressed, I kept hearing more and more about him. The attractive part is his size, his skill and he has a right-hand curve on his stick and that's somewhat unique on the old depth chart." At the end of the NHL season, the only right-hand shooting regular forward on the Flames roster was Josh Jooris, who is a pending RFA. That's it. There's not a lot of help on the way either. At Stockton, the only right-shooters up front were Garnet Hathaway, Austin Carroll, Hunter Smith, Freddie Hamilton, Drew Shore and Bill Arnold. The last three also being pending RFAs. Treliving says finding right-hand shots isn't imperative but it is a focus. "Is it an area we'd like to strengthen? Absolutely. But it's not let's just go out and sign everybody that shoots right and see if they're any good later. You still go with talent, ability and where they fit in terms of how you build your team." Treliving adds that where a right-shot up front would be a nice addition is on the power play, which was ranked last in the NHL for much of the season. "It gives you that second option. You look at the Washington power play this year. It's significantly improved. You've got (Alex) Ovechkin sitting on one spot. Having (TJ) Oshie come in there as a right-shot in the middle of a diamond, it changes the look. It's another option and it gives you another weapon for people to be concerned about." While Pribyl has spent most his career at centre, he played some of last season on the right side and make no mistake, that's where the Flames plan to deploy him. "As we went through this process, we talked to him about our plan, which is to start him on the right side. The right wing position is not a strength of ours right now. This may help." Another question is how quickly will he be ready to play. Pribyl suffered a torn ACL in early April during the semi-finals. As a result, he missed missed the league final in which his team lost four games to two. The surgery was performed in Calgary earlier this week. He will spend a majority of the summer in town with Flames doctors and other staff overseeing not only his rehab and but also getting him conditioned to be ready for training camp. While it can vary, the typical recovery timeline on ACL surgery is six months. So we'll have to wait and see if he'll be ready for rookie camp in early September. At this point, that seems overly optimistic but the good news is the injury wasn't as bad as it could have been. "It is a significant injury, but if you're going to have an ACL tear, our medical staff looked at it and said this is as good as it could be," says Treliving. "There's no structural damage, there's no meniscus or bone issues, there's no collateral damage there. A lot of times with an ACL, once you get in, you see other problems, but there was none of that. This was as clean as you can get it in terms of an ACL tear." The reality is coming over to North America for the first time, stepping right into an NHL line-up was always going to be a big ask. It will be even more difficult if he misses all or a part of training camp. Getting back to speed in the American Hockey League could be the smart move, especially considering you can do so without issue. "I've had a lot of experience with these things. There's a physical and a mental part. A lot of times after an ACL injury, you'll be back playing, but you may not be back to the level that you were at prior for some time," Treliving says. "You have to take that all into consideration." What speaks volumes about the Flames fondness for the player and his character, Calgary had the option after he tore up his knee to walk away from the deal, but chose not to. "When he got injured, we had the ability to say you know what, we're going to pass. But we felt strongly that we had done the recruiting process, he got injured but we still felt we believe in this kid, we're going to stick by him, we're going to do what we feel is the right thing to do," says Treliving. "Players get hurt. We felt that the risk to bring him in was still mitigated. Plus, if you're going to get hurt, better to get hurt in April than in November. Now he has all summer to get ready and this still gives us the full two years to see if we have a player here or not." Even if the recovery goes slow, Treliving says it's still a worthwhile investment. "Let's say it takes him a year to get back and maybe he's playing in the minors during that time. Still, at the end of the day, next year you have a 24-year-old who is still 6-foot-3 and highly skilled." The Flames hope he pans out because on an entry-level contract, he'd be making less than $1 milllion in NHL salary and that's the type of value contract the Flames will need on their roster going forward considering the big raises coming to Johnny Gaudreau and Sean Monahan in particular and Joe Colborne also. "In today's game, you have to cast a wide net. Talent is coming from all corners of the universe now. You can't be limited to one spot, or one place, or one avenue. You need to find talent wherever you can find it," says Treliving. "In this system where your hope is you're going to have young players that eventually grow and you're going to have to pay them accordingly, you have to find players that fit in certain roles at a skill level set that helps you win but also at a dollar that is manageable," says Treliving. The attraction with this signing is it's addition without subtraction. It doesn't cost you an asset. "I look at this as a swing at the plate," he says. "Where he goes and progresses from that, only training camp and the preseason and the months ahead will tell, but we've made ourselves a little deeper at a position and in areas that we need to get deeper in." But one last time, Treliving implores everyone to just see how it plays out. "I can't be any more emphatic about just letting this kid play. We're not telling him to buy property or anything yet." What are hockey fans expected to do on a night with no hockey? I suppose mowing the grass comes to mind. Well, when you're done bagging your lawn clippings, I thought I'd help fill that void leading up to Wednesday night's Predators-Ducks game 7 by digging into a variety of Flames-related topics that are top of mind. We may be into the off-season but there never seems to be a shortage of things to discuss when it comes to the local hockey team. So here we go, a new instalment of Eight From 80 Feet, which is what I call this recurring round-up of random musings. You wonder how long teams will continue to shop at the Calgary Flames outlet store come the trade deadline. So far, so good, I suppose, on the Kris Russell front but safe to say the pick-up of Jiri Hudler by the Florida Panthers was a failure. Hudler's only entry on the scoresheet in six playoff games was an assist on the first goal of the game less than two minutes into game 1. He never got a sniff after that and never played much. He finished the post-season 15th on the Panthers in average ice time . Amongst forwards, he was ninth, just ahead of Derek MacKenzie. That's the same MacKenzie that two years ago had 11 points in 82 games while Hudler was racking up 76 points for the Flames. It's the second year in a row the Flames have dealt an expiring contract at the trade deadline with that player not really working for his new team. Last year, it was Curtis Glencross that was dealt to the Washington Capitals. The glaring question remaining is does Hudler's off-season also go the same way it went for Glencross where everyone including the player keep waiting for a contract offer that never did come -- and suddenly he had retired. After all, this is a league that is trending towards getting younger and younger every year. Teams are sinking money and term into 20-somethings, not 30-somethings. Given Hudler was eighth in league scoring just a year ago and led the NHL in even-strength points, surely he'll attract an offer from some team but I'd expect the annual average value to be modest and the term short. Maybe he even ends up with a Lee Stempniak-like deal. At a similar point to Hudler in his career, Stempniak has settled for one-year deals for less than $1-million each of the past two summers. Meanwhile, the draft pick the Flames pick up from Florida will end up being as high as 53 or as low as 56, depending on what happens in round 2 of the playoffs. Specifically, it's how many division winners advance that is the trigger. Obviously, the pick will fall somewhere in the middle if there's a mixture of results. On Sunday, the Czech Extraliga league final came to an end with HC Sparta Praha losing the best-of-seven final in six games. Of course, that is the team that Daniel Pribyl plays for. It had been reported weeks ago by Sportsnet Analyst Elliotte Friedman and was noted in this primer I put together on the 23-year-old centre/right winger that the Flames are expected to sign him. 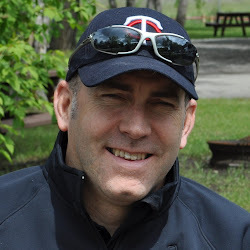 PostMedia columnist Eric Francis then reported he was going to play for the Czechs at the IIHF World Championships in May but a knee injury that sidelined him the final three weeks of the playoffs would likely impact his availability for that tournament. Today, via Twitter, there were further updates on the Pribyl situation. Czech Daniel Pribyl requires knee surgery after his playoff season ended. #Flames remain interested in signing. Will not play at Worlds. Further to @RogMillions info, Treliving says #Flames have strong interest in Czech F Daniel Pribyl and is confident they'll get him signed. This is the part where rabid Flames fans cross their fingers, toes, and whatever else they can cross. In the NHL Draft Lottery that will be held at 5 pm MT this Saturday, the Flames have roughly a 1-in-4 four chance of being one of the three teams selected and moving up somewhere into the top three. Should that happen, it would be the answer to exactly what the Flames organization needs right now as I know the team is very high on the two big right-shooting Finnish wingers that along with Auston Matthews make up the consensus top three. While Matthews' season in Switzerland ended a while ago now, the Finns continue to be hot topics as they have kept playing. At the IIHF U18 World Championships gold medal game in Grand Forks, North Dakota, on the weekend, Jesse Puljujarvi had a hat-trick in Finland's 6-1 victory over Sweden. That game demonstrated why there is so much excitement about this player, who was the MVP of the World Junior Championships. Barrelling in off the wing and using his size on one goal, a quick one-timer on another. He then capped off his hat-trick scoring a strong move to the net from in-close. Check out the highlights for yourself. Wearing No. 9, he had Finland's 4th, 5th and 6th goals. He also hits a goal post along the way. Puljujarvi missed the first three games due the Liiga playoffs back in Finland but he made an immediate impact once he arrived with seven points (5 goals, 2 assists) in his four games. The young man, who turns 18 on May 7, is listed as 6-foot-4 and 205 pounds. What an alluring talent. Meanwhile, the guy many are even more high on is his fellow countrymen Patrik Laine. Listed at a very similar 6-foot-4 and 207 pounds, he just turned 18 last Tuesday so the two are less than three weeks apart in age. Laine was not at the U18 tournament as he had more pressing matters. He was playing in the Finnish league playoffs and enjoying plenty of success too. Wearing jersey No. 29 for Tappara in the video below, he scored once and set up the other two goals last Friday in a 3-0 win over HIFK that at the time evened the league final at 2-2. Since that game, Tappara went on to win the next two games including a 2-1 victory today in game 6 to win the league championship 4-2. In the deciding game, Laine scored the tying goal and had a game-high seven shots. Did I mention he just turned 18? That's nuts. Patrik Laine. Winner of Jari Kurri Trophy, Finnish league playoff MVP. With 10 goals in 18 games, Laine was the leading goal scorer in the playoffs and he was tied for third overall with 15 points. Just as impressive, his 112 shots on goal in the post-season were 29 more than the next player. What a bright future this kid has. It's safe to say that Saturday will be a nerve-wracking night for Flames management as well as fans. To get you warmed up, try the Future Considerations Draft Lottery Simulator. With a mock draft built into it, it's a good one but as a warning, it's very addictive. 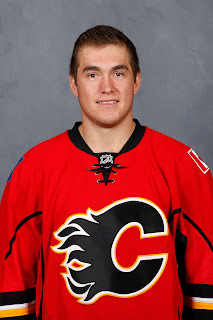 It should be noted that only twice in the last 17 years have the Flames picked in the top six but they hit home runs with both with each player a core part of the future of this team in Sean Monahan (6th in 2013) and Sam Bennett (4th in 2014). While Calgary may not get the that big strapping Finnish right winger they were hoping for, they should still leave the draft with a player that should be a big part of the future. I'll have more on the draft prospects outside the top three in the weeks to come. Two months later, it's interesting to see how usage has changed with some and values could be changing. These playoffs in particular have been fascinating given so many goalies have come off the bench to supplant the starter and in many cases lead their teams to victories. St. Louis moved on to the second round Monday night with a thrilling 3-2 game 7 victory over Chicago. Elliott is a big reason why the Blues were able to knock off the defending Stanley Cup champions. Ranked No. 2 on my list of demoted veterans two months ago, should the 31-year-old lead St. Louis to a few more series victories, maybe even the Stanley Cup, where does he fit in next year on a team that has Jake Allen as their future? I'm thinking his performance will make it even harder to get Elliott out of St. Louis. He's on an affordable contract and if they like their mix and see their window to win as right now, they'll want to keep both guys. A very similar situation as I had Andersen listed as No. 1 on the demoted veterans list. He's five years younger than Elliott so that puts him in a bit of a different light but like St. Louis and Allen, the Ducks also have a young star in John Gibson, who you'd think is still their future. Gibson opened the playoffs in net for Anaheim but was replaced after the Ducks went down 2-0 and it's been Andersen's crease ever since. A pending RFA in line for a big raise, the more Andersen plays and the better he performs, the higher the asking price is going to be for the big Dane. Again, one wonders how keen Anaheim will be to get rid of though, especially if they go on to enjoy a long playoff run with him as their guy. He has been outstanding for the Lightning, reinforcing his importance to that team. Should the Lightning move on from Steven Stamkos and my gut feeling is that's exactly what happens -- Jonathan Drouin's emergence a pivotal factor -- than they should have the money to re-sign Bishop, who as it stands today would be a UFA after the 2016-17 season. However, in that case, perhaps Andrei Vasilevskiy becomes a target as a young player that the Lightning might be willing to trade given they would almost certainly lose him for nothing in an expansion draft. Another curious situation. 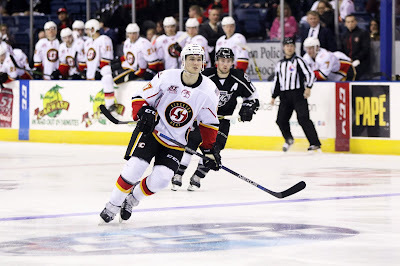 Murray topped my list of AHL starters looking to break through and you can see why. But of course, the Penguins still have Marc-Andre Fleury under contract for three more years. If there's no expansion, a Murray-Fleury tandem will look great for Pittsburgh for the immediate future but should there be an expansion draft, the odds of losing one of them would be high so again, does one of them become free. Depending on how the remainder of these playoffs go, might the goalie that becomes available be Fleury instead? Stay tuned on this front as we keep a close eye on how Murray performs. What a performance by Corey Crawford in game 7. He was phenomenal in keeping the game tied and giving the Blackhawks a chance to pull out a win. It goes to show that Crawford is still very much the man in Chicago so where does that leave Darling, who is a very capable back-up and ranked No. 2 on my list of back-ups looking to break through. Darling is a pending UFA after next season and you know the Blackhawks won't be able afford to re-sign him so perhaps the 6-foot-6 keeper could be available this off-season. That was a might fine body of work the Czech turned in against the Capitals after relieving a very mediocre Steve Mason halfway through the series. I don't see Neuvirth as an option for Calgary given he very well could be a guy the Flyers re-sign and move forward with given Mason will be a pending UFA next season. Meanwhile, Thomas Greiss has impressed with the Isles, playing for the injured Jaroslav Halak. Petr Mrazek is clearly the guy in Detroit now although I'm not all that keen on Jimmy Howard if I'm the Flames. Two things I've taken away from this post-season. The importance of quality goaltending has only been reinforced. They can steal you games, they make your penalty-killing much better. Bringing a top-notch goaltender could turn around the Flames fortunes pretty quickly. There are going to be decent goalies available this summer, especially if the league announces that an expansion draft will go ahead in June 2017 and teams get nervous about potentially losing a good goalie for nothing. But what is Calgary prepared to surrender? So far, so good, for the Flames and their hopes of the second round draft pick in 2016 they got from Dallas in the Kris Russell deal becoming a first round pick instead. In that deal that saw Calgary pick up D Jyrki Jokipakka and 2014 second rounder C Brett Pollock, Calgary also got a conditional second round pick. The conditions were that it would convert to a first round pick if the Stars can progress to the Western Final and if Russell plays a minimum of 50 percent of the games in rounds 1 and 2. While the ex-Flame did miss one game due to being ill, he played in the other five. Of course, getting past this next round will be awfully tough. Now that the Blues have slayed their demons in ousting Chicago, they are going to be a tough team to stop. Plus it wasn't all that re-assuring to see the Stars nearly fritter away a four-goal lead in the third period on Sunday. As a reminder, while Calgary was last in the league in save percentage in 2016, Dallas was 29th and it's showing. They switched to Antti Niemi for games 4 and 5 then went back to Kari Lehtonen again in game 6 but after that third period implosion, who knows who will start in the next round. But, the Stars offence is sure going, Jason Spezza has stepped up and played really well. If they can get Tyler Seguin back that would be a big boost with Jamie Benn doing his regular thing. This next series should be a good one given the contrast styles of the team teams. St. Louis swept the season series. Should Dallas defeat St. Louis, the Flames draft pick will fall between 27 and 30 depending on how much further the Stars advance. If the Blues win, that draft pick will end up being 55 or 56. That's a big difference. Safe to say most of Calgary will be rooting on the Stars. Looking ahead to new faces we might see in Stockton in 2016-17, second rounder D Rasmus Andersson and sixth rounder LW/RW Andrew Mangiapane are both age-eligible to play in the AHL next season and given where their games have progressed to in major junior, I would expect both of them to make that jump. Looking at the rest of the 2015 NHL Draft, we know D Oliver Kylington already played there this season with him not subject to the age rules having come from Europe. As for fifth rounder C Pavel Karnaukhov (Calgary, WHL) and seventh rounder D Riley Bruce (North Bay, OHL), they were born in 1997 so will have to wait at least one more year. I should add that G Nick Schneider, who played nine games for Stockton after his season with Medicine Hat ended, is also not age-eligible to play in the AHL next season so he'll be back in the WHL for at least one more year. From the 2014 draft, G Mason McDonald would be old enough to be assigned to the AHL this year and while I'd suggest that or the ECHL is likely, it may depend on what happens in addressing the goaltending this summer. McDonald could also return to junior as an overager. There won't be anyone else from that draft class. 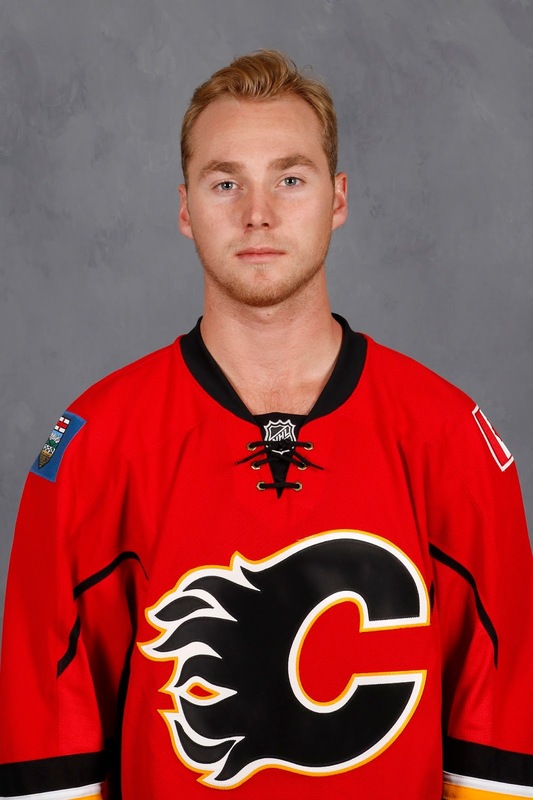 First rounder C Sam Bennett is in Calgary, second rounder RW Hunter Smith and seventh rounder RW Austin Carroll played this year in Stockton. Third rounder D Brandon Hickey has confirmed he's heading back to Boston University and sixth rounder D Adam Ollas-Mattsson has another year remaining on a two-year deal he signed with Djurgardens in Sweden. The only other of note that will be turning pro for sure is 2013 third rounder Keegan Kanzig, who started in the AHL this season before returning to the WHL for his overage season. The Barrie Colts find themselves in a huge hole after losing once again to Niagara on Monday night. Despite entering the series as the favourite and opening up at home, Barrie is down 3-0 and are looking at a must-win on the road when the series resumes on Wednesday. In the third round series, Mangiapane has two goals and two assists including a dandy shorthanded goal in game one that you can watch on the OHL website, It's at around 1:05. Overall, Mangiapane is 10-11-21 in 14 post-season games while Andersson is 2-12-14. Despite the heightened competition of the playoffs, both have continued to put up offence just like they did in the regular season. It's still over four months away but the anticipation is already building for the Young Stars Classic tournament given the kind of talent that could be on display in Penticton this September. After all, the four teams in that tournament are among the six lowest finishers in the NHL -- Winnipeg (25th), Calgary (26th), Vancouver (28th), Edmonton (29th). Wouldn't it be something if that much ballyhooed top three of Matthews, Laine and Puljujarvi all end up heading to the Okanagan. While Connor McDavid got all the hype last year in Penticton as the first overall pick in the 2015 NHL Draft, the other three teams were without first round representation from that previous draft. Winnipeg - Both of its 2015 first rounders -- LW Kyle Connor (17th) and C Jack Roslovic (25th) went to college so were unavailable. Vancouver - Its 2015 first rounder RW Brock Boeser (23rd) also was unavailable due to being in school. This year would more closely resemble 2014's tournament that featured C Leon Draisaitl (3rd to Edmonton), C Sam Bennett (4th to Calgary), LW Nik Ehlers (9th to Winnipeg) and C Jared McCann (24th to Vancouver). The star power that year, fresh from the 2014 NHL Draft, would have been even better had RW Jake Virtanen (6th to Vancouver) not missed the tournament due to injury. Playing hooky to play hockey. 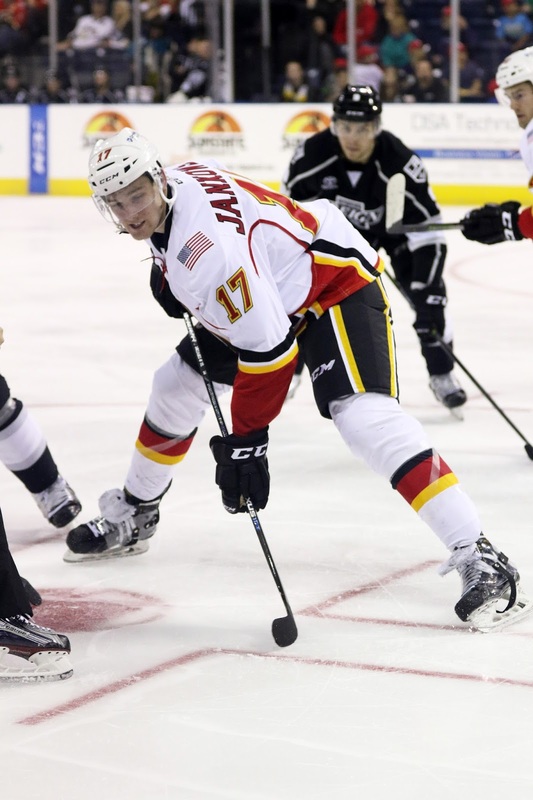 That's basically what it came down to for Providence College senior Mark Jankowski as the longtime Flames prospect cut 17 days of school earlier in the month to travel across the country and play eight games for Calgary's AHL affiliate in Stockton, California. Having just arrived back on PC's Rhode Island campus this week, I caught up to the 21-year-old by phone from his dorm room, where we chatted about many things including his first taste of pro hockey and how that went, the bittersweet ending to his college career and what summer looks like now that he's employed as a hockey player. "I had done a lot of summer school to get ahead. So I'm pretty lucky that I only have three classes left to graduate," said Jankowski, completing a degree in Business Management. "Before I left, I met with all three of my professors and they were all very cool with it. I stayed in touch with them while I was out in Stockton and now that I'm back, I have a few homework assignments to catch up on, then I just have to write my final exams and I should be good." The reality that Jankowski was playing at a new and higher level of hockey set in immediately in his first game on April 1 against Ontario, the Los Angeles Kings affiliate. "First thing I noticed is after every whistle and especially that game in particular, there was some sort of scrum going on. Maybe not a fight every time, but there was something going on. Coming from college where we have cages and can't fight, that was really different for me." Jankowski was joining in progress some rivalries that were well-established and are naturally going to become heated when you play the same teams as often as you do with the AHL's new divisional alignment that sees the five California teams in the Pacific Division play each other all the time. That night, for example, was the 11th time Stockton and Ontario had met. That included a fight-filled game on New Year's Eve. "The hatred that the two teams had. You could definitely see it, and every game I was there, we were playing against one of those California teams so I saw it a lot. My first five games were Ontario, San Diego, Ontario, San Diego and then San Diego again. We played the same two teams for a while so you could really see the tension build up." The temperature rising outside the rink was also a different experience. "The weather was unbelievable. I was wearing shorts and a t-shirt every day, which was great and way different from Providence, where it's much colder at that time of year." 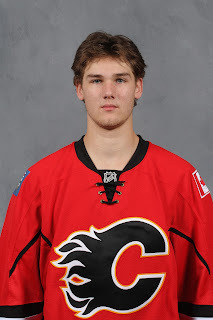 Jankowski spent his time in Northern California sharing an apartment with 18-year-old goaltender Nick Schneider and defenceman Keegan Kanzig, who had each joined Stockton after their WHL seasons had ended. Located right beside the rink and with a restaurant on the main floor, Jankowski said it was an ideal set-up. In eight games, Jankowski had two goals and four assists including a four-game point streak. "A great experience," he said. "There were a few nerves in that first game and then you just try and shake those off. I felt that as I got going, every game I was getting more comfortable and more confident, just getting back to playing my game that I've been playing my whole life." 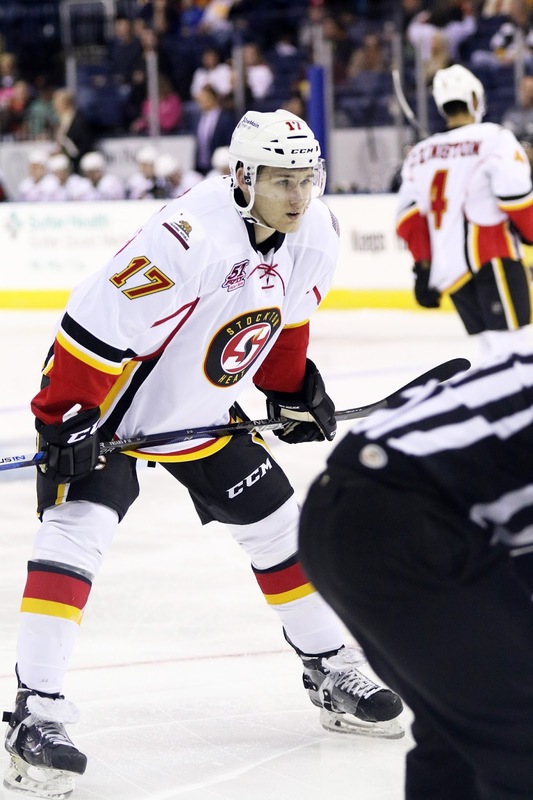 As Jankowski was unable to participate in the Flames 2014 summer development camp due to injury, the only previous experience Ryan Huska had with him came from last year's July camp. "For me, it was still a bit of an unknown what he was all about when he came here but I can tell you I was pleasantly surprised and very happy with what he was able to do in the short period he was with us," said the coach of the Heat. "He showed an offensive side, he showed a responsible defensive side, he can make plays from the middle of the ice and every game he played for us, he got much more confident to the point where we were using him in tons of key situations at the end," Huska said. "And a lot of the games that we were playing down the stretch, we were still fighting to get ourselves into the playoffs so the games meant something and I felt he raised his level every game. "He has a lot of intriguing factors about him because he is that big centre man. If he can continue to put on the weight and continue to challenge himself and come back to camp with confidence, I'm excited to see what he's going to do next year." While he played with a variety of linemates, the one constant was he was deployed at centre the entire time. "Face-offs went OK. While they didn't know me, I didn't know them so it was new for everyone and there was no real advantage for either of us," said Jankowski. "I had some good games, had some bad games in there but it was great." Face-offs is an area Jankowski takes a lot of pride in. Tracked as part of Hockey East's advanced stats the past two seasons, he was an impressive 58.1 percent at the dot in 2014-15 before falling off to 52.1 percent this year. "It's such a big part of the game, especially with all the focus on possession right now. You want to have the puck as much as possible and it starts right away from the face-off," he says. "I've worked a lot at it, it's no different than anything else that you're working on in your game and it's an area that I'm looking to to be successful with in the future." All in all, he says he got exactly what he wanted out of his short California adventure. "After our season ended. I knew it would be beneficial to come down for that couple weeks and get those games in. Everything off the ice, on the ice, it was beneficial just to see what life is like as a pro and I'm very glad that I did that." The trip to the West Coast was a nice way to finish off the hockey year after a bittersweet ending to his college career. Not just because the reigning national champs, the top seed in the Northeast Region, got eliminated on the first night of the 16-team NCAA tournament, but because of the individual circumstances for Jankowski. "I was pretty sick with the flu. I started feeling it the day before the game and thought hopefully it will just go away. But then I woke up the morning of the game and felt 10 times worse," said Jankowski, who was the Friars' leading scorer with 40 points (15 goals, 25 assists) in 38 games. "But still, I was like I'll go to morning skate, sweat some of these things out, then hopefully have a good pre-game nap and get ready for the game. Unfortunately, it didn't work out that way." Despite his will to be out there on the ice, leading his team as one of Providence's alternate captains, as the 1-1 game went into overtime and then double overtime, he just couldn't persevere any longer. "After the first overtime, I couldn't hold it anymore. I went to the bathroom and started puking and that's when the trainer saw me and took me out," he said. Jankowski was by himself in the trainer's room when the winning goal went in. "I heard a bunch of cheers from the crowd so I asked hey, what happened, someone go check and they told me we lost. When I heard that, especially not being out there with the guys when it happened, it was a tough, tough feeling and a difficult one to get over. After everyone got changed, the guys stopped by the trainer's room to talk to him. "Definitely an emotional night as we had our final good-byes as a hockey team," said Jankowski, one of nine players that were together for all four of his seasons. "But only one team gets to win it all at the end. We were lucky enough for that to happen to us last year. We have a lot to be proud of, especially our team this year, we accomplished a lot and we all recognize that." With Jankowski completely focused on the playoffs up until that point, no contract discussions had taken place yet. Those were saved for after the season ended, after giving him some time to recover from the flu and the sudden end to his collegiate career. There were two things that Jankowski knew going into the negotiations. One was that he definitely wanted to be part of the organization that showed such faith in him by taking him 21st overall in the 2012 NHL Draft. Second, he wanted the next step to be what was best for him. "I always wanted to be a Calgary Flame, that was never an issue for me. It's been a great organization, they've been nothing but top notch, especially when the management changed and Mr. Treliving and his staff took over. We've talked a lot, we have a very good relationship and I just felt this was definitely the place where I wanted to be a pro hockey player." A path so many college players have gone down previously -- see Kenny Agostino, Ben Hanowski, Bill Arnold, Bryce Van Brabant -- was demanding during the contract talks to sign a contract that began immediately. In such a scenario often referred to as 'burning the first year', he would have been added to the NHL roster, paid an NHL salary for the remainder of the season and also gotten into some NHL games. While that wasn't the initial offer on the table, the Hockey East First Team All-Star probably could have got it had he pushed for it. After all, he had the leverage of being able to become a free agent if he waited until August 15. Instead, Jankowski agreed to the deal that was offered, which was a two-year, two-way entry-level contract that begins in 2016-17. In that scenario, he was able to go to the AHL this season by signing an amateur try-out (ATO) with Stockton. "You can look at all things and take everything into consideration. The one thing I have to look at is what's best for my development as a hockey player," he said. "I felt what was best for me was getting better from being sick then going into Stockton and getting a feel for what professional hockey is like. Being there for the couple weeks that I was, I got to play eight games and it was a very valuable experience that I can look back on this summer as I'm training and getting ready for training camp." As he catches up on missed homework assignments and gets ready for his graduation on May 15, the native of St. Catherines, Ontario, says he's ready for the next chapter in his hockey career. That includes continuing to get bigger. 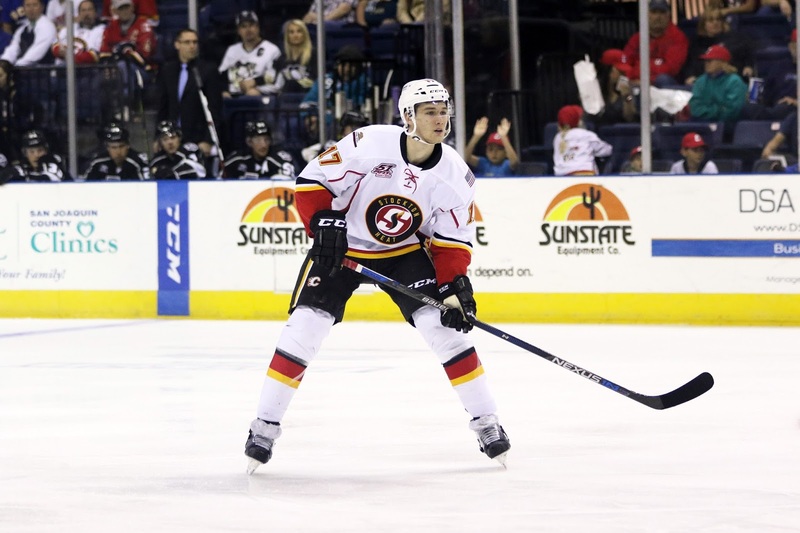 A scrawny six-foot-two and between 165 and 170 pounds when he was drafted by former Flames GM Jay Feaster four years ago, he's now six-foot-four and played this season at 198 pounds. His next goal is to get to between 200 and 205 pounds by development camp and at that point, he'll meet with Flames strength and conditioning coach Ryan Van Asten and set another goal for September. He knows Van Asten from having worked with him last summer when he arrived in town ahead of development camp. He plans to spend even more time in Calgary this year, training hard with the many players in the organization -- including guys on the NHL club -- that also work out at least part of the summer in town. Another thing he's looking forward to next season is being reunited with Jon Gillies, his teammate for three years at Providence including that 2015 championship team. "We've been texting and talking. It's definitely nice to have someone in the same organization that I've spent so much time with over the years. We can talk about things, he can show me the ropes a little bit. I've known him so well for the past four years, Jonny and I getting to be teammates again will be a great experience. We've had some success in the past together and we definitely want to have success in the future." While the experience will be new this summer in concentrating fully on hockey, the surroundings will not be. When you've been around the same organization as long as Jankowski has, there are lots of familiar faces at this point. He roomed with Patrick Sieloff when he came to Calgary last year. He also lists Morgan Klimchuk, Brett Kulak and Kanzig among the other guys he's gotten to know quite well over the years. "One of the biggest things I can take away from my time in Stockton is while I may have had a little bit of success in the first stint, I need to have a huge summer and be prepared for training camp and next season. That league, like any pro hockey league, is not easy. You can't take anything for granted. Any success that you've had. You have to build off that and you can't be complacent." Just look at guy like Klimchuk. A prolific scorer during his time in major junior, he scored just three goals and nine points in his first pro season. The jump to pro hockey is always big one. "(Jankowski) did have success while he was here in this short stretch and it's how he handles that success moving forward that will be key," said Huska. "His mindset has to be I'm going to make an impression when I come to my next camp. They're going to notice me on the ice and I'm going to make sure every day that I'm playing for keeps. Then I think you'll see a guy that a lot of people will notice when he steps onto the ice." For Flames fans, their next opportunity for an eye examination of the much talked about prospect will be at WinSport in July. But unlike the past four years, this time when that camp ends, Jankowski's message to his teammates won't be see you next summer, this time it will be see you in September. Rookie camp, the Young Stars Tournament in Penticton, main training camp. Life as a pro hockey player begins. "I'm excited for the summer but also really excited for next season. This is my first summer as a pro and it's already starting to sink in that this is my job now. It's not just school anymore." It appears the off-season work for Flames general manager Brad Treliving has already begun. 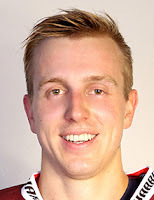 Sportsnet Analyst Elliotte Friedman reported late Saturday night that it is expected that Calgary will announce the signing of forward Daniel Pribyl once the Czech playoffs are over. 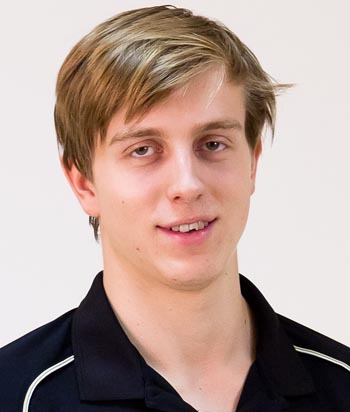 No comment from CAL, but word is Flames will sign Czech F Daniel Pribyl after that league's playoffs. A natural centre that has also played right wing, the 23-year-old was a sixth round draft pick of the Montreal Canadiens in 2011. He is a free agent and last month it was reported by TSN hockey insider Bob McKenzie that there were at least six NHL teams pursuing him with Nashville and Pittsburgh among them. Contract-wise, Pribyl will be subject to the NHL's entry-level system. Based on being age 23 as of Sept. 15 of this year, my understanding of the collective bargaining agreement is that Pribyl's ELC would automatically be a two-year, two-way deal. The most his NHL salary could be is $925,000 with bonuses potentially on top of that. Pribyl plays for HC Sparta Praha in the Extraliga, Czech's highest-level hockey league. The team is based in Prague, the country's largest city with a population very similar to Calgary at just over one million. After a second place finish in the 52-game regular season, Sparta is currently playing in the best-of-seven league final against regular season champion Liberec. The series is tied 1-1 and resumes with game 3 in Prague on Monday. As one of the youngest players on his team, Pribyl led Sparta in scoring this past season and finished tied for second in the league with 45 points (16 goals, 29 assists) in 45 games. He was a plus-15 with 12 penalty minutes. He had kept the production going in the playoffs with 11 points (5 goals, 6 assists) in 9 games. However, due to a lower body injury, he has not played for the past two weeks, missing the team's last four games. After starting out playing hockey in his hometown of Pisek, a 90-minute drive from Prague, he joined the Sparta Praha organization in 2009-10 at the age of 16. He played one year on their U18 team, a year-and-a-half primarily on their U20 team, before moving up to their main team during the 2011-12 season. 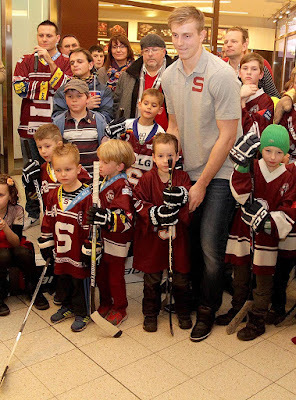 Other than being loaned for the final couple months of 2011-12 to the team's affiliate in the second division, he has spent all his time with Sparta with this season basically being his fifth in the Extraliga. This is a young player whose points-per-game has steadily increased each season and appears to be just entering his prime. Pribyl is not altogether new to the Scotiabank Saddledome. 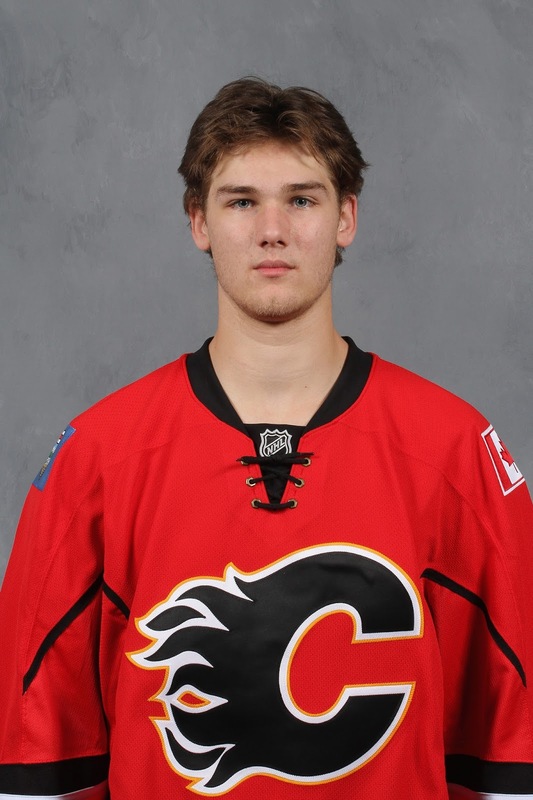 He played for the Czech Republic in the 2012 World Junior Championships that was co-hosted by Calgary and Edmonton. While the Czechs played in Group B that played their games in Edmonton, he did appear in two playoff round games in Calgary including a heartbreaker when the Czechs lost 2-1 in overtime to Russia in the quarterfinal. They then beat Slovakia 5-2 in the fifth place game, also played in Calgary. Limited by a leg injury suffered during a pre-tournament game, he finished with one assist in five games. Edmonton defence prospect David Musil, who played this past season at Bakersfield (AHL), was also on that team. Pribyl ticks several boxes on the wish list for Treliving. He has size, he plays right wing, he shoots right, and he can score. Whether or not he has the ability to play right wing on the Flames top line remains to be seen. But that would be pretty lofty expectations. Heck, whether or not he even makes the NHL roster at all is very much an unknown. On a two-way deal, he could easily be shipped to Stockton as was the case with Jakub Nakladal to ease the adjustment to a new country, new system and the smaller North American rink. We'll have to wait and see what this guy is all about when he arrives in town. The one thing that obviously works to Pribyl's advantage at is the (lack of) depth chart on the right side. While in his fight to crack Calgary's blueline, Nakladal was up against a bunch of established veterans with one-way deals, right wing is much thinner. In terms of right-shooting forwards in the organization, it's a barren wasteland at the moment. While Michael Frolik, playing his off-wing, has become a fixture at right wing, the remaining spots have been a carousel of left wingers filling in on the right side. Two of the four regular right wingers to begin the 2015-16 season were shipped away at the trade deadline in Jiri Hudler and David Jones. While this is still very much speculative as there has been no official announcement made by the organization, the next step one would expect for Pribyl is a trip to Calgary for development camp in July, similar to how the Flames began to integrate Nakladal last summer. That gave the defenceman a chance to meet the coaching staff and get orientated a little bit to the city, making the transition a little bit easier come September. Notably, Pribyl will be coming over to North America four years younger than Nakladal. Come the fall, I'd expect he would be a participant in rookie camp and while he's a bit older than the norm, potentially that would include a trip to the sunny Okanagan and the Penticton rookie tournament. Flames main camp would follow after that. Of course, this move will conjure up memories from four years ago when Roman Cervenka, also a Czech, was signed by Jay Feaster. At the time, the Flames GM described him as a "highly skilled player with great hands, excellent vision and the ability to score goals at an elite level." Widely viewed as a failed venture, Cervenka got off to a tough start by missing the already-abbreviated training camp due to blood-clotting issues. Then came the controversy about what position he played. 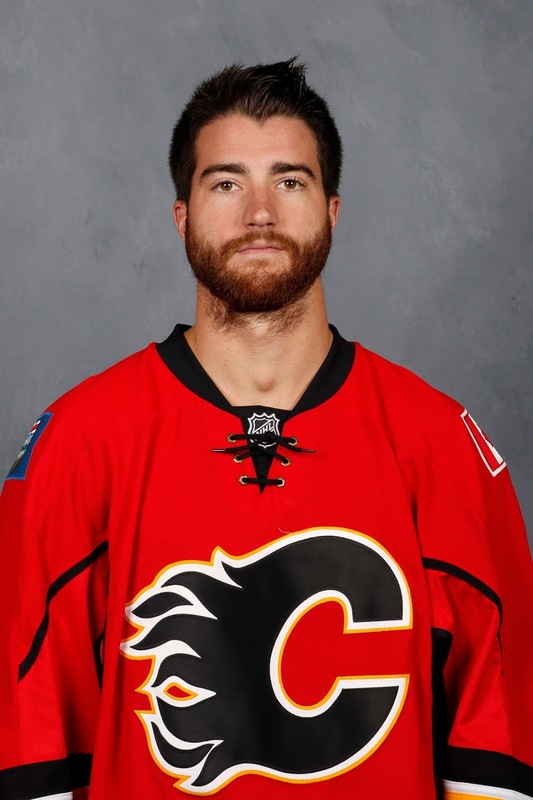 The Flames touted him as a centre and that's where they hoped he'd play, ideally in a top six role. Later it was learned that he wasn't really a centre at all so that misunderstanding was a bit awkward. One notable difference is Cervenka, a 5-foot-11 left-winger, was 26 when he came over. Cervenka had 17 points (9 goals, 8 assists) in 39 games during that lockout-shortened 2012-13 season. After that one year, he returned to the KHL, signing for the kind of big money he wasn't going to get from Calgary even if there was an appetite to play another year in the NHL. Of course, another veteran Czech on the roster right now is Ladislav Smid. Around for over 100 years, Sparta Praha is looked at as one of the most famous hockey clubs in the Czech Republic. To celebrate the team's 100th anniversary in 2004, an all-star team was named with former Flame Jiri Hrdina named as one of the three forwards. Hrdina, who came over to North America at age 29, was part of Calgary's Stanley Cup-winning team in 1989. Interestingly, former minor league goaltender Danny Taylor is currently one of the team's goaltenders. 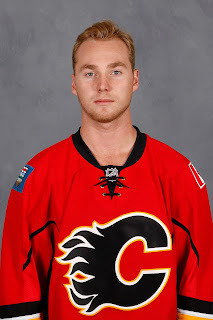 He spent two seasons with the Flames organization, making two NHL starts with Calgary during that 2012-13 season. This is an ideal addition for Calgary. Among the many things to like about the signing is it doesn't cost you a thing. It's adding an asset without having to give up one. Whether or not it works out remains to be seen but it's the kind of creative thinking you have to applaud the GM for. There is no risk in bringing him in yet there could be a giant upside. Considering the big raises due to Johnny Gaudreau and Sean Monahan this summer, it's the type of value contract that is ideal. If it works out, what a bonus that would be for Calgary. Given his age and pro experience, there is no reason to think he can't step right into the NHL line-up too. Yet, the team has the luxury of not needing to rush him if he's not ready. He can go to California and spend some time in the AHL first. How is his skating? What are his other attributes? I can't honestly tell you. But his hands sure look pretty smooth as seen on this highlight-reel goal from this year's playoffs (via Reddit). That inside-out move once he got to the net was strikingly similar to Sam Bennett's finish on Marc-Andre Fleury earlier this year. Here's another Pribyl goal from a couple years back that wasn't too shabby either. We will learn a lot more about this player as we go along. Once the signing is officially announced, we'll get more intel at that time from the club as they've scouted him. But for now, this is what we know. It's going to be a long summer for the Flames with them not making the playoffs but with the draft lottery less than two weeks away now, then the draft and free agency after that, and with all sorts of needs to address, you get the sense this off-season will be a busy one and far from uneventful. With the season complete, the buzz word around the Flames front office has been 'evaluate'. The coaches, the players -- all of them are having their performances in 2015-16 evaluated. I figure there's no reason I should be exempt from this exercise so today I evaluated how I did this year also, specifically in regards to my Eight Bold Predictions made prior to the season. What's interesting is how expectations change over time. Eighty-two games later, some of these predictions don't seem all that daring but really, they were at the time. I recall one reader in particular referring to them all as "ridiculous". So, let's revisit them one-by-one. Below are each of the bold predictions verbatim from what was posted on Oct. 6, 2015. Highlighted under each one is my self-assessment on how I did, along with some related notes, stats and comments. All this guy does is create offence and that isn't changing anytime soon. After a dominating three years at Boston College, it took him 11 days to acclimate to the NHL but once Johnny Gaudreau got his bearings, he ripped it up to the tune of 64 points (24 goals, 40 assists) over his final 75 games. Let's not forget, this coming after he'd been accustomed to playing 40-45 games per season at Boston College. The 22-year-old is a fixture on the top line -- the chemistry with Sean Monahan continues to get better and better, he's a mainstay on the power play, and 3-on-3 overtime and the acres of open ice that comes with it was built for a guy of his talents. After finishing tied for 29th in NHL scoring a year ago, expect a bump up to 75-80 points this season and a top 10 finish. You can expect him to remain in the top 10 for many years to come. COMMENT: This was one in particular that doesn't seem all that bold now but at the time, it really did feel like an ambitious prediction given the volume of established, in-their-prime star players perennially found at the top of the NHL's scoring leaders. 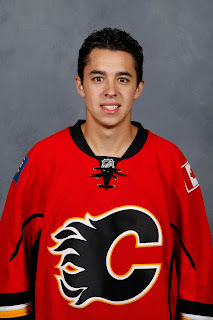 Oh, and Gaudreau, 22, was entering only his second pro season. While the diminutive star finished 106th in road scoring (7-15-22), he more than made up for it at home, where he finished 1st (23-33-56), two points better than Patrick Kane. Add those splits together and Gaudreau (30-48-78) finished tied for sixth overall -- behind only Kane (46-60-106), Jamie Benn (41-48-89), Sidney Crosby (36-49-85), Joe Thornton (19-63-82) and Erik Karlsson (16-66-82). With a more potent power play and/or without missing three games, he's probably in the top five. As I wrote in this piece late in the season, the production the Flames have gotten from Gaudreau and Monahan at such a young age has been nothing short of staggering. 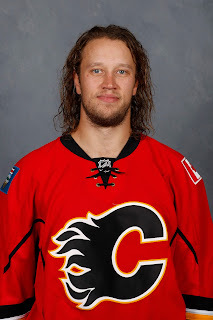 When my phone buzzed early in the morning on July 1 with the announcement that Karri Ramo, just hours away from being an unrestricted free agent, had been re-signed by the Flames for $3.8 million, you knew right then and there that didn't happen for him to be waived and sent to the minors three months later. The urgency in bringing back the 29-year-old Finn suggests he's the one coach Bob Hartley trusts the most and sure enough, he'll be between the pipes for the season opener against the Vancouver Canucks on Wednesday. Ramo went 15-9-3 a year ago in 32 starts. With a stronger team in front of him and Jonas Hiller on his way out at some point, expect an additional 25 starts this year and 15 more victories as he spends the season as the team's No. 1 goalie. COMMENT: Clearly I blew this one although I wasn't as far off as you might think. While it looked in October like I would be a full 30 wins off my prediction, a change to Ramo's style as explained in this piece made him more 'quiet' in net, improved his performance and resulted in more consistent play. With that, he took over the No. 1 job and was up to 17 wins when he suffered a season-ending knee injury on Feb. 11. Had he stayed healthy, continued to get a majority of the playing time, winning 13 times over the final 29 games was not out of the realm of possibility. Now, we wait and see what the Flames decide to do with their goaltending this season after a year in which they set some pretty ugly historical marks both individually and as a team. 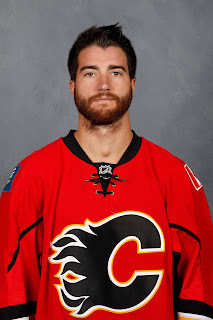 Lost in the hype around Dougie Hamilton and the excitement of Mark Giordano being healthy again is the fact TJ Brodie could soon be the best of the three, even though his pay stipend won't reflect that. Brodie, 25, has been on a rapid ascent the past few seasons. Don't be surprised if the Hamilton-Giordano pairing -- that has looked less than scintillating so far -- does not last and Brodie ends up back in his familiar spot with Giordano shortly after he returns from his broken hand. Brodie was three seconds behind Giordano in average ice time at the time of his injury last year and his 25:12 by season's end ended up two seconds more than the captain and tops on the team. It still seems like a bold prediction given all the attention surrounding the other two but I wouldn't be surprised at all if No. 7 ends up pacing the team once again and makes his $4.65 million cap hit look like robbery. COMMENT: One of the storylines out of camp was Giordano and Hamilton playing together on the top pairing. 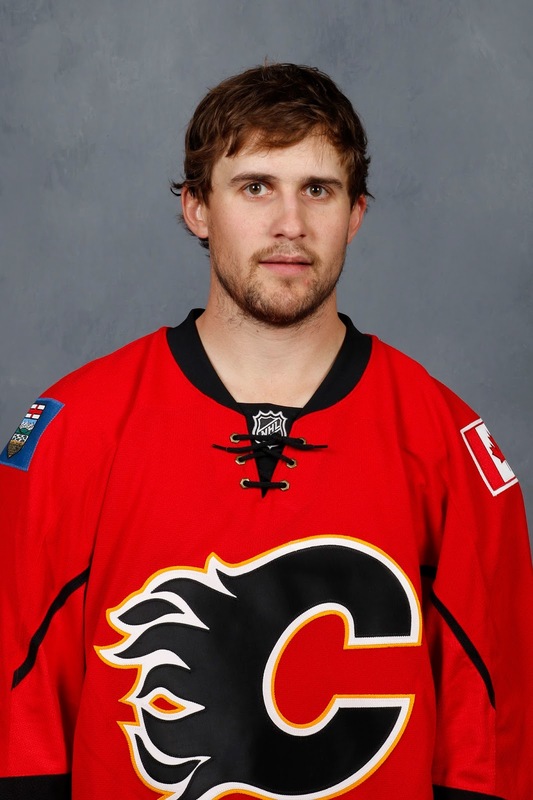 With Dennis Wideman and Kris Russell reunited, that presumably meant Brodie on the third pairing with Deryk Engelland when he returned from his wrist injury. Well, that's a good idea except for the fact that it was a terrible idea. While some were of the mindset that Giordano has been propping up Brodie, if his play after Giordano was injured last year wasn't proof enough, it became increasingly obvious this year that if anything, it's the opposite. Heck, when Giordano was selected to go to the all-star game, even he essentially said they picked the wrong guy. Excelling in all situations, Brodie finished the year with an average of 25:15, which was No. 1 on the team and 11th in the NHL. It was 28 seconds more than Giordano and over five minutes more than Hamilton. There's bold, there's extra bold, then there's uh-oh-better-call-an-ambulance type of bold. At first blush, this may sound like a case of the latter given the Flames dubious history in Southern California that we've heard about ad nauseam. Calgary hasn't won a regular season game in Anaheim in their last 20 visits (0-15-5) dating back to 2004 and have just once one win in their last 30 tries if you go back to 1999. Nonetheless, the Flames enter the year an improved team, they're a greatly motivated team after being dispatched by the Ducks in the playoffs and with three trips to Honda Center this season, expect a couple wins (one in the first meeting on Nov. 24 and once the jinx is broken, the next win will come far easier), one giant sigh of relief, and a Flames team with considerably less baggage should the two teams go on to meet in the Pacific Division final. COMMENT: This seemed to be the year to break the jinx. The Flames lost the first crack at it 5-3 in late November but that was OK as they still had two more tries and at that point Anaheim seemed beatable. Due to their shaky start, Calgary was still four points up on the Ducks when they met at the Saddledome on Dec. 29. But Anaheim won 1-0 that night and it was a turning point for both teams. By the time Calgary made its second trip to the Honda Centre on Feb. 21, they were well back and the home side was riding a lengthy hot streak. The Ducks won 5-2. The Flames were even further back when they lost 8-3 on Mar. 30 to set an NHL record for futility against a particular opponent. Most head-scratching for me is it's not like Anaheim is running roughshod over teams at the Honda Center. In addition to losing to Nashville in game 1 of the playoffs, they lost on home ice during the regular season to Arizona (x2), Vancouver (x2), Carolina, Chicago, Colorado, Detroit, Edmonton, Los Angeles, NY Islanders, NY Rangers, Tampa Bay, Toronto, Washington and Winnipeg. I don't get it, I just don't. Expect Hartley to start off as he left off last season with a top line of Gaudreau, Monahan and Jiri Hudler. 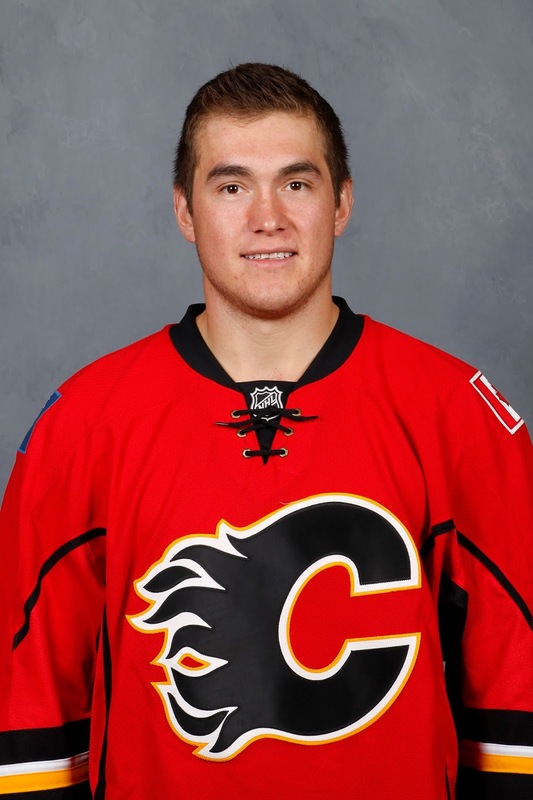 However, expect to see big, rugged Micheal Ferland on that line before too long. Gaudreau is the key to the offence and knowing the threat he is every shift, expect opponents -- especially divisional foes -- to play him much harder this year with the volume of whacks on the wrists to increase. At 12 and 14 penalty minutes respectively, Monahan and Hudler are not the calibre of security detail Hartley may be content with. By slotting Ferland into Hudler's spot, which we saw the coach tinker with throughout September, you add some muscle and a shenanigans-deterrent to that line yet Ferland is still a guy with very good hands and a high hockey IQ. Meanwhile, Hudler with Bennett and Frolik if that is how the second line shakes out would be an effective trio also. COMMENT: Do I get half marks? It sort of went as expected. Hudler was the most frequent right-winger on the top line the first few months before the revolving door really got spinning after Hudler was dealt to Florida at the trade deadline. Lining up there most often was Ferland, who looked great at times with them but didn't look so good at other times. According to Dobberhockey.com, the most frequent winger on that top line was: 1. Hudler, 2. Ferland, 3. Jones, 4. Jooris, 5. Colborne, 6. Shinkaruk. Who will play on the wing in 2016-17 is one of the unanswered questions. The draft lottery could provide an option should Calgary land one of the top Finns. There is free agency with the Isles' Kyle Okposo an intriguing although probably too rich option. There's also the possibility of an off-season trade. But until one of those three things happen, Ferland remains very much in the mix. The ramp-up will be slow as Hartley does the responsible thing with a 19-year-old player with just a dozen NHL games on his resume by giving him sheltered minutes on the third line. However, don't expect his linemates to be Josh Jooris and Micheal Ferland for very long. I fully expect Bennett will barge his way into the top six and play at a level that demands more ice time and expect the coach to oblige. I liked Bennett between Czech countrymen Jiri Hudler and Micheal Frolik in the pre-season and that trio reunited along with power play time on the second unit should get Bennett in the vicinity of 60 points by season's end. If you're looking for an exact split, I'll say 25 goals and 35 assists. His buddy Connor up the highway in Edmonton will be getting all the Calder hype, but know that a very driven and competitive Bennett will want to be in on that conversation also. COMMENT: OK, at 36 points (18 goals, 18 assists), he didn't really come close. However, there was a point where we was on a real roll while playing left wing on a line with Mikael Backlund and Frolik where you wondered if there was maybe a chance. A three-point night in San Jose on Feb. 11 gave Bennett 28 points on the season but more notably, 14 points over a span of 13 games. Had he been able to continue to score at that point-per-game pace for the rest of the season, he would have reached 60 points. While that wouldn't have been a very realistic expectation, considering the hot-hand Backlund had over the final couple months, you never know. Instead, Bennett was switched to centre a week later and inserted between two less-skilled wingers and saddled with more defensive responsibilities, the offence dried up. At one point, he went 18 games without a goal. 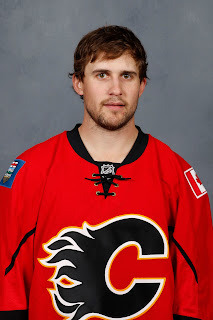 With over $17 million annually committed to Giordano, Hamilton and Brodie, the reality is it's going to be nearly impossible to retain Kris Russell given where his value is at. When Giordano went down last year, Russell logged a lot of vital minutes and really raised his profile. But deeper on the back end now thanks to a strong draft, developing youth and free agent signings, Russell will likely be a victim of Calgary needing to skimp salary-wise on remaining defencemen in order to keep all their core pieces up front. 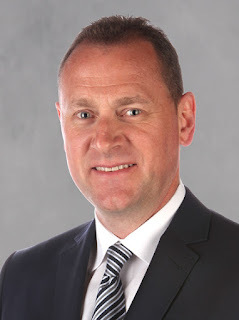 If Brodie's return reduces Russell's role and given the presence of Jakub Nakaladal, Tyler Wotherspoon, Ryan Culkin, and with Rasmus Andersson on the way, it gives Treliving the luxury of moving the pending UFA for assets, rather than lose him for nothing. Remember how important those two draft picks received for Curtis Glencross turned out to be. COMMENT: As the trade deadline approached and Russell, a warrior of a hockey player, remained on the sidelines with a minor injury despite resuming practicing, it became clear his days were numbered and this was a team protecting its asset. Sure enough, on trade deadline day, GM Brad Treliving pulled the trigger and shipped the 28-year-old to Dallas in return for young Finnish defenceman Jyrki Jokipakka, 2014 second round pick Brett Pollock, finishing off his major junior career with the Edmonton Oil Kings where he was the team's leading scorer, and a second round draft pick in 2016. The caveat with the draft pick is it converts to a first round pick should Dallas reach the Western Conference final and Russell appear in at least half of the games. So far, it looks like a terrific trade as Jokipakka played very well for Calgary and seems to have all the makings of a solid, reliable blueliner. It sounds like a lot but Calgary won nine of the 13 games that were decided in 4-on-4 OT last year so it's not as out there as you think. Of the seven games that went to a shootout last year, if another four of those end up ending in OT now, which seems like a safe bet given our short sampling of 3-on-3 and how quickly the games tend to be decided, then a dozen victories isn't out of the question. While we'll have to see how it plays out, I think Calgary is a team built for the 3-on-3 format. With their mobile, good-skating defencemen so adept at jumping up in the play already, the Flames don't need to resort to the risky three forwards that some teams are considering, just link up their established forward pairings with one of Brodie, Giordano, Russell, Hamilton and it's game over. COMMENT: It looked they were going to achieve this no problem. In fact, it looked they were going to obliterate it. When Russell scored the winning goal in extra time in Nashville on Dec. 15, that was the Flames eighth overtime win and it came in game 30. Little did we know that over the final 52 games -- seven of them going to extra time -- Calgary would prevail in OT only one more time to finish the year with nine, which was still tied with Detroit and New Jersey for fourth. Los Angeles (12), Chicago (10) and Philadelphia (10) finished with more 3-on-3 victories. As focus turns to the off-season, a heartfelt thanks to all of you for hanging with me in 2015-16. Hope I was able to provide some insight.